La Famiglia is a well-established brand of pasta produced from quality, durum flour, in your favorite forms. From thin spaghetti with 100% durum flour, popular fusilli, to small tubertini and ditalini for salads, La Famiglia is here for all your creative culinary ideas. La Famiglia Spaghetti NR 6 are produced of high- quality 100% durum flour. Spaghetti with a thin form designed for all of your culinary creative ideas in packaging of 500 gr. La Famiglia Spaghetti NR 10 500gr are produced of high- quality 100% durum flour. Spaghetti with a thin form designed for all of your culinary creative ideas in packaging of 500 gr. La Famiglia Cornetti creste are produced of high- quality 100% durum flour. Shell shaped macaroni ideal for salads and all of your culinary creative ideas in packaging of 500 gr. 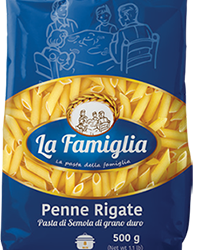 La Famiglia Penne rigate are produced of high- quality 100% durum flour. Elliptical shaped macaroni designed for all of your culinary creative ideas in packaging of 500 gr. 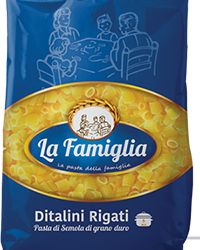 La Famiglia Ditalini rigati are produced of high- quality 100% durum flour. Small shaped macaroni ideal for salads and all of your culinary creative ideas in packaging of 500 gr. 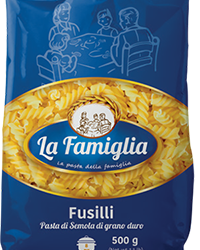 La Famiglia Fusilli are produced of high- quality 100% durum flour. Spiral shaped macaroni designed for all of your culinary creative ideas in packaging of 500 gr. 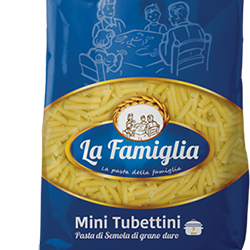 La Famiglia Mini tubettini are produced of high- quality 100% durum flour. Miniature shaped macaroni ideal for salads and all of your culinary creative ideas in packaging of 500 gr.